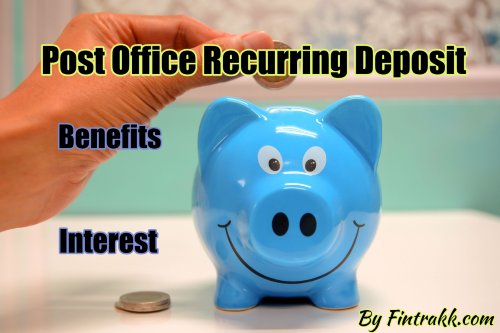 Recurring Deposit (RD) is a special kind of term deposit account offered by the banks operating in India. Under this account scheme, an individual can deposit a fixed amount every month into their Recurring Deposit account and earn interest at the rate defined by the RBI for the period of deposits. This is a very popular saving scheme for salaried employees with limited income source. Post office also offers Post Office Recurring Deposit Scheme, that’s what we shall discuss here. Recurring Deposit account are generally opened for a pre-determined fixed period of time. The deposits are to be made at regular intervals as decided by the account holder and deposit scheme opted. The deposits can be made on monthly or quarterly. Indian Post Office offers their customers with an option to a 5 year recurring deposit (RD) account. The account holder can add their savings on monthly basis and earn fixed interest on same. Who can open Post Office RD account? Every Indian citizen who has attained 18 years can open a Recurring Deposit account in Post Office. Even minors who have attained 10 years can open post office recurring deposit account. How to open Post Office RD account? The interested individual must submit self-attested copies of PAN Card and AADHAR card (for Address Proof and ID proof) for KYC verification purpose. Note: Senior citizens have different form to be filed for opening the RD account. The recurring deposit in post office can be opened for 5 years (60 months). As per post office rule, the minimum amount to be deposited in RD account must be not less than Rs.10. There is no maximum ceiling limit for RD deposits. The deposits are to be made on the date decided at the beginning of account opening. In case the due date is missed then it would be considered as default in payment. The due date here mainly ranges in between 1st to 15th of each month. The contribution made under post office RD is not eligible for claiming any tax benefits or deduction under any sections. In case the account holder have made 4 defaults in paying the deposit amount to post office, then the account holder at his own discretion can extend the maturity period of the account or the given months defaulted. In case the account holder has defaulted for more than four times in making payment then the account is discontinued and no further deposit can be made. But, the account can be made operative only if all the defaulted deposits are made within a period of two months from the month of fifth default. In such case of default, penalty are to be imposed on the account holder at the rate of five paise for every five rupee of defaulted deposits. Once the total deposits are made and the penalty fees are complied with the RD account shall not be treated as discontinued. Note: In case of Defence Services Personnel (excluding Civilian Defence Employees), instead of 4 defaults limit, the default limit is extended to 7 defaults. The rest of the rule of penalty and payment remains the same. ALSO READ National Pension Scheme vs Public Provident Fund: Which one to choose? Advance deposits are referred to the deposits made in advance. An account holder can make such advance deposits for a period not less than 6 months. The depositor receives discount for very deposit made. The account holder can decide to close the account before the maturity date (i.e. before completion of 5 years). The account can be prematurely closed only after a period of 3 years from the date of account opening. The account holder will also receive the interest earned for the period of deposit along with the amount of investment. Note: The account cannot be closed for the period up to which the advance payment is made. In case the account holder has completely paid 60 monthly instalments till the time of maturity, then the account tenure can be extended for further 5 years. However, this extension of period for the account would be considered as fresh account and all new rules and interest rate would be applicable. The rate of interest on RD account is decided by Government of Indian on annual basis. Post Office RD account on-going interest rate is 7.3% compounded quarterly. ALSO READ What is XIRR, IRR and CAGR: How to calculate Returns on Mutual funds? Note: The interest rates are subject to change. So, kindly confirm the same from respective Post office before investing. The below table helps us to understand the return that an individual at the year-end in case the individual invests Rs.10 each month under this scheme. The Post Office scheme is risk free and reliable. But, this is not majorly popular in today’s time due to a number of investment schemes available. However, individuals can opt for Post Office Saving Schemes if they are looking for safer investment options. What do you think about Post Office Recurring Deposit Scheme? Will it fetch you the requisite returns? Or are you willing to diversify and look for different investing alternatives? Feel free to share your feedback. Great article. Provides comprehensive information and current interest rate and rules. Only one suggestion — the last section would have been more informative if you could have provided the historic interest rates, as that information is difficult to come by, and some of us have PO RDs going back 15 years. Hi Anitha, Thanks for your valuable feedback. We shall update this post with interest rates for past years also to make it more informative for readers.